Compound twin turbo systems can also offer the best of both worlds, a smaller, fast spooling turbo for low end power and a large turbo for unbeatable high end power. What Make and Model Truck Do You Have? Turbochargers compress the air entering the engine. 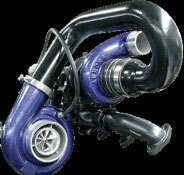 Turbos use a forced air induction system. Turbos are powered by the hot exhaust gasses that exit the engine. As the exhaust gas leaves the engine, it passes through the turbo and spin a compressor wheel. This wheel compresses the intake air and forces it into the engine. When air is compressed it is more dense, and has more oxygen molecules than naturally aspirated, uncompressed air. By forcing oxygen-dense air into a cylinder more fuel can be utilized while still maintaining the correct fuel air mixture intact. In doing this, you get more power from each explosion in each cylinder. A turbocharged engine produces vastly more power than the same engine naturally aspirated. Turbocharging drastically improves the power-to-weight ratio of an engine, while also decreasing EGT’s significantly. Installing an aftermarket upgraded turbo offers several crucial advantages. An upgraded turbo is one of the most significant upgrades that you can make to your diesel. Though high end turbos can be expensive, they are one of the most cost effective ways to drastically change the performance of any diesel truck. Aftermarket turbos are available in many different configurations that can be advantageous to your specific needs from your diesel truck. Whether you need better quick spooling, high pressure turbo performance to keep up with your towing needs or more high end power to obliterate the competition, an upgraded turbo can give you everything you need and more. Compound twin turbo systems can also offer the best of both worlds, a smaller, fast spooling turbo for low end power and a large turbo for unbeatable high end power.